Film-Noir is a genre so confidently dominated by Hollywood that it takes a film of monumental brilliance to find success in the genre when made outside the valleys of oranges and glamour. France has Henri-Georges Clouzout’s Les Diaboliques, Germany has Fritz Lang’s M but here in the U.K. we have a Film-Noir that stands higher in the polls than all of the American efforts to grace the genre (at least if IMDB is anything to go by). The Third Man doesn’t seem particularly British at first. It’s set in Vienna at a time when the city was split into different zones boasting various nationalities, its two main leads are the most typical of American actors and its famous score is played by local Zither extraordinaire Anton Karas. Yet the film is distinctively and obviously British. Carol Reed is a director of the Powell and Pressburger breed, adding a wonderfully stiff upper lip ideal to the whole affair. Often called an actors director, Reed coaxes performances out his players that are rarely bettered in the genre and the dialogue fizzes and sparks off each character like a linguistic fireworks display of witty bravado. The story itself is based on a short novel by Graham Greene (who incidentally also put together the screenplay) and this further adds to the British aesthetic that shines through its foreign setting. We follow the story of Holly Martins, a writer who is visiting Vienna to meet his old friend Harry Lime. However upon his arrival he finds Harry has been mysteriously killed in an accident, which begins the unravelling of an abhorrent, underground penicillin racket. The story has many twists and turns which, if revealed, would lessen the impact of the film but suffice to say the story has many unforgettable scenes. Considering Orson Welles’ screen time adds up to little less than ten minutes, he casts a long shadow over the film and dominates the narrative as well as stealing the lime light from lead actor Joseph Cotten; even managing to take over the cover sleeve of the DVD. It’s a fair turn of events though and every scene of Welles’ is famously brilliant. The initial reveal of him by the casting of light from a window has entered into screen history while his improvised speech on the Ferris wheel about cuckoo clocks is often quoted for its sheer genius. The final ten minutes are a gripping, climactic chase through the Viennese sewage tunnels and as the famous theme music fades over Lime’s final fate the viewer knows they have witnessed something special. In the end we’re left with a sad epilogue for all the characters as Lime’s lover Anna, spurns the affections of Holly who has gradually fallen in love with her throughout the film. It seems such a gentle ending for a noir about a drugs racket but it’s what makes it so quintessentially British. The Optimum Classic release of the film is a two disc special which boast a small collection of intriguing extras. The film itself has had a wonderful restoration and the soundtrack in particular is as clear as when it was first shown. Included on the release is an interesting extra on Anton Karas’ score which covers the history of the musician and tells of how he went back to playing in cafes almost immediately after recording the film’s soundtrack. The second disc contains one simple but huge documentary, charting the problems of filming the story or more specifically, the problems of filming with Orson Welles who appears to have been elusive on set as the actual Third Man himself. 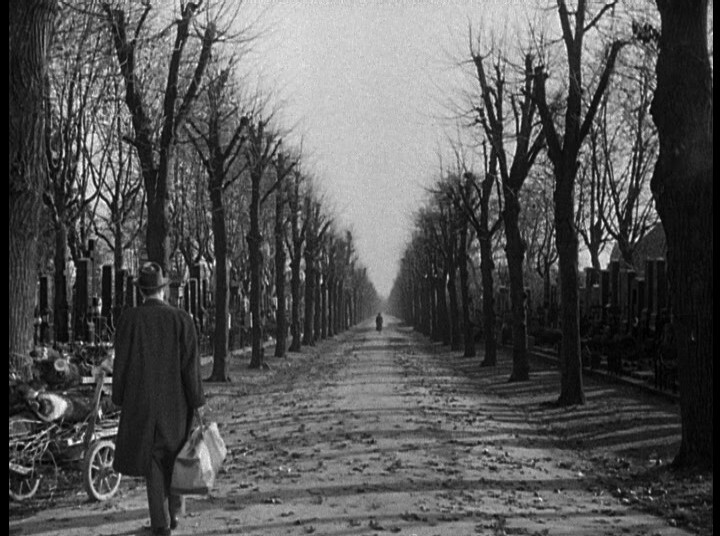 The Third Man is not a film needing any more praise or love letters yet the film’s modesty means that it feels ok to keep on waxing lyrical about it. Even though it’s topped the BFI’s best British film of all time poll, the hype is still justified and its mix of typical British exterior with some of the finest talents from the world of cinema created one of the greatest experiences celluloid can ever provide. I’m glad you mentioned the ending – people get wrapped up in Orson Welles standing in doorways & rattling on about Cuckoo clocks, and forget about the beautiful, bittersweet final shot.